The battlefields lay silent but for the sound of our tears against the earth, now and forever a melody of the saints. There is no comfort worthy of such great sacrifice, no lyrics able to do the truth of heroism justice. Only our memories of those loved and lost can ease the terrible price we have paid that others may know the shelter of independence. Today we have whispered goodbye to two favored sons of America. We have given their souls to rest in the loving arms of heaven that they may find eternal peace. … we have stained the sands crimson. SSG Tuialuuluu was born in Pago Pago American Samoa on December 13th, 1980 to Vaimili and Ululima Tuialuuluu. SSG Tuialuuluu entered active duty on August 16, 1999. From 1999 to 2001 he was Stationed at Fort Campbell, Kentucky and was stationed at Camp Greaves, Korea from 2001 to 2002. On July 19th, 2002 he was assigned to Alpha Company 3-21 Infantry where he has served as squad leader. SSG Tuialuuluu awards and decorations include the Combat Infantry Badge, the Expert Infantry Badge, Bronze Star, Purple Heart, Army Achievement Medal with two oak leaf clusters, National Defense Service medal, Korean Defense Service Medal, Kosovo Service Medal, Good Conduct Medal, Army Service Ribbon, Global War on Terrorism Medal, and NATO Ribbon. 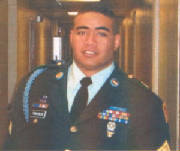 SSG Tuialuuluu is survived by his wife Andrea and his daughter Esetavave. SSG Tuialuuluu was expecting his second child in May. SGT Mitts was born in Hammond, Oregon on November 20th, 1980 to David Bright and Cindy McEwen. SGT Mitts attended Warrenton High School. SGT Mitts entered active duty on August 11th, 1999. From 2000 to 2002 he was stationed at Fort Campbell, Kentucky. On the 10th of September 2002 SGT Mitts was assigned to Alpha Company 3-21 Infantry where he has served as team leader. SGT Mitts awards and decorations include the Combat Infantryman Badge, the Expert Infantryman Badge, Air Assault Badge, Bronze Star, Purple Heart with oak leaf cluster, Army Achievement Medal, Good Conduct Medal, National Defense Service Medal, Army Service Ribbon, and Global War on Terrorism Medal. SGT Mitts is survived by his wife Tara. SGT Mitts was expecting his first child in February. Copyright©2004-2005 J.Ruiz . All rights reserved.